An outrageously unsafe 1970s amusement park provides the ideal location for Johnny Knoxville's uniquely idiotic brand of self-abusive stunts. ACTION POINT is a misfire of a movie. 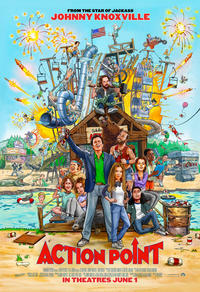 Johnny Knoxville and co. try to sweeten their wild-and-crazy comedy and end up with sheer agony - for the audience. These dubious achievements are losing whatever appeal they once had as he gets older. Much like the rides that inspired it, Action Point is a fast and funny thrill ride without brakes. She said, "It's for 8-year-old boys - like you." Ouch. This nostalgic look at pre-lawsuit, 1970s recreational hazards plays like "Wet Hot American Jackass". Watching Knoxville and his team design some of these truly life-threatening rides and conceive the stunts would probably be more interesting than the movie that resulted from them.